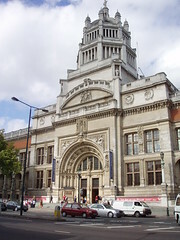 Museum in South Kensington, often referred to as the V&A. Entry is free, though donations are solicited. It specialises in the decorative arts, covering textiles, ceramics, sculpture, jewellery, musical instruments, ironwork, et al. It is certainly one of London's finest museums, with a well-chosen collection wonderfully displayed by thematic areas, and extensive enough that a single visit could never be enough to see everything of interest. From its nineteeth-century origins as the Museum of Manufactures, the collections have been led by the desire to educate and inspire artisans of all kinds, and many of today's younger visitors can be seen sketching away or taking copious notes to stimulate their own designs. Indeed, while some areas of the museum are obviously suitable for the casual sightseer, with well-lit and spacious displays annotated with interesting facts, others almost feel like part of a research library, such as the textiles room with its shelves of tightly packed pull-out frames of embroidered textiles. This interplay between museum and designer is not one-way, as contemporary design finds its way back into the museum with surprising rapidity; for example, in March 2010 the Fashion gallery included an item from Alexander McQueen's spring/summer 2010 collection. The building itself is a fine example of decorative architecture; even the interior corridors are adorned with mosaics and frescoes. It is built on several levels, centered around a outdoor garden area (the John Madejski Garden). Galleries and mezzanines allow the occasional view from one floor to another — indeed, some of the exhibits are so large that they may be best viewed from the floor above (for example, the Cast Gallery's 15 metre tall plaster casts of Trajan's Column, a Roman monument). On Friday evenings the museum is open later than usual for various drop-in events including Friday Late, a "contemporary late night event" on the last Friday of every month (except December). As an example, the March 2010 Friday Late was themed around social games such as Pass the Impossibly Large Parcel (just what it sounds like) and An Expedition with Mr Mirrors (an explore-the-museum game linked to the currently-popular social media game Echo Bazaar). It's worth getting hold of a map from the information desk (free, but a £1 donation is suggested), since the museum is large and can be confusing to find one's way around in (not all staircases go to all floors, for example, and signage is scarce). Another option would be to go on one of the introductory guided tours, which are free of charge and take place throughout the day. Venue Hire: As of 2007, drinks in the John Madejski Garden followed by a fork buffet in the Dome for four hours for a Saturday evening is £8,000 plus VAT (bit hard to find the info on the website, look under Resources->Corporate Events). If travelling by Tube, it can be handy to know that South Kensington Station has a direct tunnel link to the museum; the above-ground route can be a little confusing and involves crossing a busy road. Last visited by Kake, 10 March 2010. Venue hire information verified by [Juliette]?, some time in 2007. Opening hours taken from the V&A website, February. Note that the various study rooms have differing opening hours, so check the website if planning to visit them. Last edited 2019-02-07 12:49:32 (version 12; diff). List all versions. Page last edited 2019-02-07 12:49:32 (version 12).